Multi-instrumentalist Calie Cox is a veteran of the Sacramento(CA) music scene since the 80's where he was founder and part of three original bands (none of which you could possibly know of unless, of course, you where from the area) and an independent project called The Big Band! which received local airplay. According, to his sparse-on-details biography, Mr. Cox recorded two discs in the 90's, neither of which he cares not to mention. 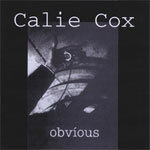 Now in 2008, Cox has started to get busy again releasing two works: the solo effort, 'Obvious' and The Temple Of Now's 'Two Worlds' a collaboration with another homegrown musician keyboard player Dave Baxley. With the exception of the obvious 80's style of melodic and progressive rock inherent in the sound, there is little frame of reference here to work with. Of the two works, both are generally better than average accomplishments with the former being slightly more interesting than the latter. Again, the context of both recordings is basic melodic, sometimes hard, rock with a (very) mild dose prog rock. Essentially, both are showcase pieces for Cox, specifically his song composition and singing (he sounds a bit like Geddy Lee), but more so his guitar playing. On 'Obvious' he's backed up a bunch of friends, including Baxley; on 'Two Worlds,' it's only he and Baxley. However, it's all Cox, all the time, and he's a very good guitar player. Honestly, this is the best part of both albums (next to his versatile singing style). Frankly, this is one of the downfalls in both works, 'Obvious' in particular. Many of the songs languish in compositional mediocrity seeming only to exist for a Cox guitar solo. Of the 13 tracks on 'Obvious' I would say more than half serve this purpose. 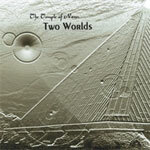 As for The Temple Of Now's 'Two Worlds,' my first question is, where is Dave Baxley? He's a co-writer and co-performer on what is largely a Calie Cox adventure. His presence is felt early on 'Another Day' and especially on, the most excellent, 'Temple Of Now.' After this, I really didn't notice him until 'The Other Side Of Darkness' where his old school keyboard work steals the show. Basically, those three songs are the highlights. Indeed, the rest of the songs are well composed and performed, but they're ordinary sounding as if you accidentally put one song on repeat, left the room and, when you returned, thought you heard them all. I actually found myself slapping my hand away from the next track button on my CD player. Finally, some general observations on both pieces. Both works, but especially 'Obvious,' sound muffled from a soft production. Additionally, at times, the performances sound stiff as if Cox and company are trying to hard to get things right; or they sound like they didn't rehearse enough and stumble through the songs making glaring mistakes ('Reflections' on Obvious for example). Also less could have been more: many songs could have been shorter, more precise, and many could have been dropped (choosing from the many ballads). However, with these and the other caveats, I have no doubts about one thing: Calie Cox is a very good guitar player, singer, and song writer. Both 'Obvious' and 'Two Worlds' are showcase pieces for longtime Sacramento musician Calie Cox. Cox is an exceptional guitar player, and a fine singer/songwriter composing and playing better than average 80's influenced melodic hard rock with prog nuances. If you can wade through some generic moments and the superabundance of ballads, you will find some noteworthy and inspiring songs on both discs.